Figure 7. 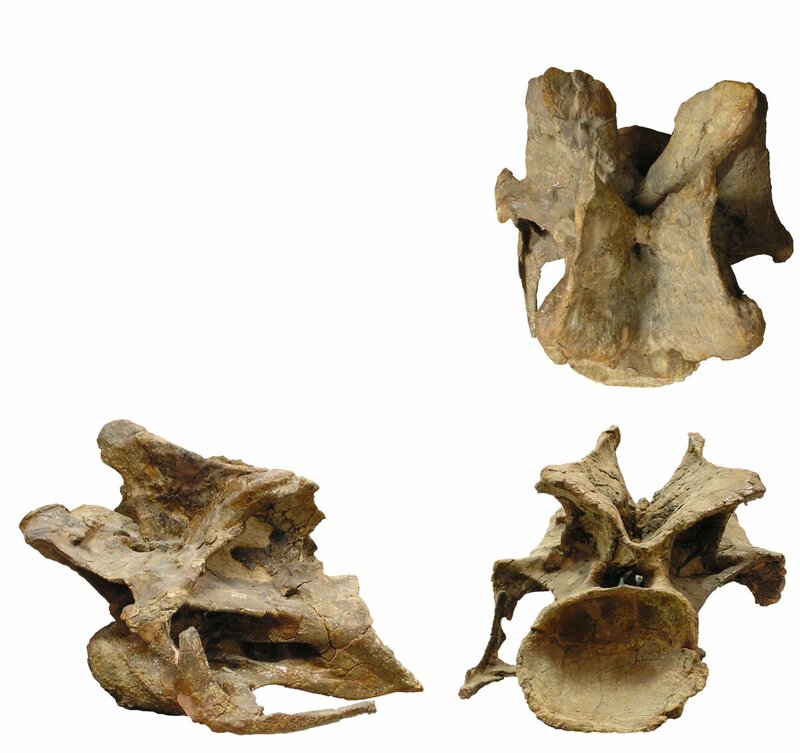 BYU 12613, a posterior cervical of Diplodocus or Kaatedocus in dorsal (top), left lateral (left), and posterior (right) views. It compares most favourably with C14 of D. carnegii CM 84/94 (Hatcher, 1901: plate 3) despite being only 42% as large, with a centrum length of 270 mm compared to 642 mm for C14 of D. carnegii. I will go around changing the links here and elsewhere (FigShare, etc.) to the new version, but I probably won’t have time today, as I have an all-afternoon community outreach at the local public library to help organize. I realize that some people, including possibly my coauthor, will hate this because now we have created some uncertainty about which is the version of record. So we’re not going to ask for any more changes, no matter how egregious the errors we find (and we are certain to find a few more, that’s just the nature of the beast); as far as I’m concerned, the second corrected version is the final version. Also, the changes made are tiny and don’t affect the science at all, so it’s not like we’ve moved any important goalposts here. If you have strong feelings about this either way, feel free to sound off in the comments. Guilty as charged! A full-color figure of a bunch of coexisting diplodocoids would rock. I assume you’re volunteering for next time–I will definitely keep that in mind.